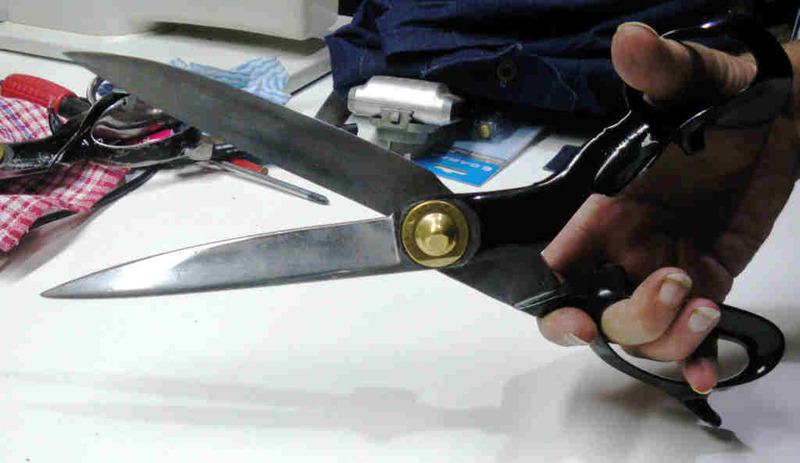 There is a reason why tailors of old used large and heavy shears when cutting out garments but there are not many left who can explain what the advantages are and more importantly, how to use them correctly. 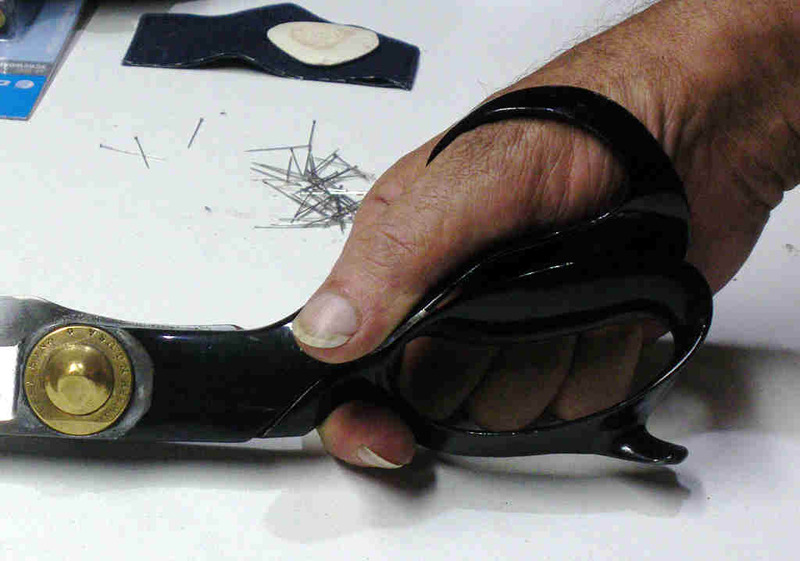 What is being shown here is how shears of this size and weight are designed to be used and to address some of the problems that people have had using them due to their size and weight. Some mistakenly try to use large shears like dressmakers scissors and while people with large hands and strong wrists can pick them up and use them in this manner, they are primarily designed to be used on a cutting table where the table carries the weight of the shears. This means that the weight of the shears becomes your friend in that they are far more stable due to their mass and their weight helps to reduce the cutting load which matters for people who spend a lot of time cutting out fabric. This is a pair of 14 inch Wiss shears made about 1930 and in comparison to modern scissors they are very heavy yet because of their weight and strong blades they cut light to medium weight fabrics on a cutting table with ease and excellent accuracy. Like any specialised tool their use is an acquired art but when used properly they perform better than the vast majority of modern scissors and at a reduced fatigue level. There is a reason why shears have the notch in front of the lower finger loop, it is so the index or trigger finger can hook up near the front of the handles which has the effect of pulling the thumb in the top thumb loop into the right place. The photo show the index finger and the thumb without the 2nd, 3rd and 4th fingers in the finger loop so that you can clearly see the angle from the ball of the thumb to the index finger which is roughly 45 degrees. This alone gives you much more control and it also makes it easier to lift the front of the shears. 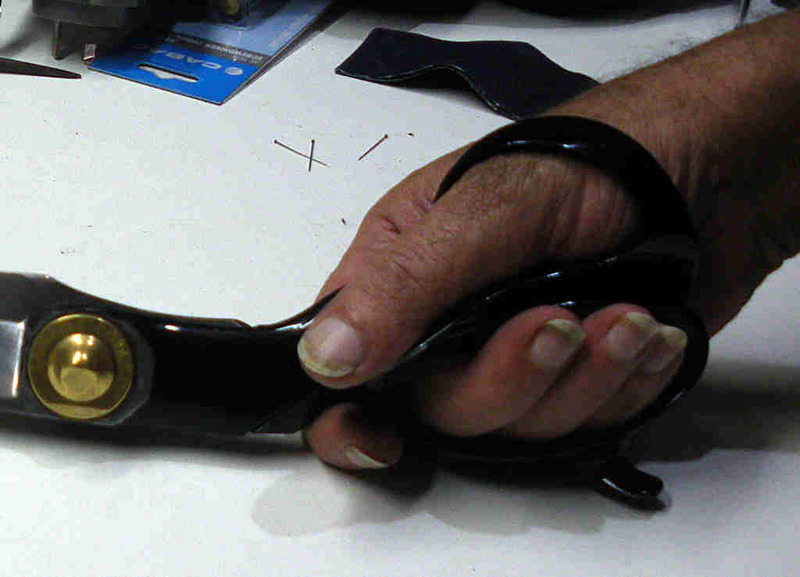 This photo shows the way to hold shears in the manner they were designed to be used. This gives you the maximum power while cutting and the best control. It also allows you to control the amount of side pressure on the blades as the three finger in the finger loop pull into the palm of the hand. This allows you to adjust your shears with very little preload across the blades which in turn reduces the amount of wear on the inside faces of the blades. Mastering this technique gives you far better tactile feedback (literally the feel of the fabric being cut) and improves your accuracy and control. An added advantage in learning how to use shears correctly is that you can get a wider opening of the shears which allows you to make longer straight cuts with improved accuracy. This photo shows how the shears are normally used on a cutting table. The lower blade rests on the table which carries the main weight of the shears and the contact point of the lower blade to the table acts as a pivot which gives you increased stability and accuracy when cutting shapes in fabric. The lug at the rear of the shears under the finger loop is designed to assist in cutting very heavy fabrics so that if you need additional force you can rest the lug on the table and use your weight to push down on the thumb loop. How and why does this work ? When you rest the shears on the cutting table the pivot point is up near the front of the blade where it touches the table. The weight of the shears increases the inertial mass of the shears so they remain more stable and allow a far higher level of control and accuracy when cutting curves and shapes. These are among the reasons why the "old fellas" prefer bigger heavier shears, more power, higher precision and a lower cutting load.